The Self of man in course of time shall ripen. The summer heat has returned, asking us to slow down once more and accept the rhythms of the natural world which surrounds and sustains us. Many of us are longing for the cool days of Autumn and all of us would love to see some rain! The impulse flowing through the School for creative renewal remains strong, and work is beginning and continuing on many projects as the fire of imagination is willed into action and brought to fruition in the physical world. The Parents and Friends Group is blossoming; the Parents Room has new life and beauty as it develops into a welcoming and nurturing space for our parent community, and exciting plans are afoot for some fun times to come! Just as the heat of this late summer stretch reminds us all to slow down, I am also reminded that the urge we feel to renew and improve our School cannot be rushed. If we do not find our own spaces to reflect on the way things are and the way we would like them to be, we will rush on to a point of exhaustion. One of the challenges of this moment in our School’s story is the need to sit with the frustration of things we want to change and the uncertainty of what is to come, and to acknowledge that this place of vulnerability is also the place of creation. We will be holding an information session about the management structure changes on Thursday 10th March, 7.30 – 9.00pm in the Eurythmy Room. I look forward to seeing you there, but as always, if you have any questions about the changes please feel free to contact me directly. Welcome back to all Playgroup families for 2016 and our groups are settling in for another wonderful year. We welcome eleven new families into our community. Autumn is upon us already although the hot weather still prevails. Over the last weeks we have had lots of outside water and sand play. We have made tissue paper butterflies, walnut boats and banksia fairy houses in our Playgroup garden. We have also begun making cane raffia Easter baskets for felt Easter eggs to sit in. We are all enjoying summer/autumn seasonal fruits with home-grown grapes, figs, plums and pears on our morning tea plates. Thank you Penny and Quincy for the beautiful Tromboncino zucchinis that look amazing on our morning tea table. It’s been another lovely week at Kindergarten. 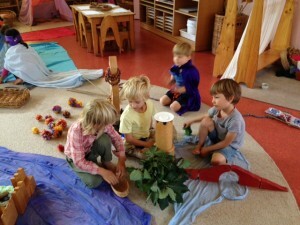 Thank you so much for your support with entering the Kindergarten quietly and departing promptly. The more we can do to bring our awareness back to the children and keep the space from becoming hectic, then quickly the children will settle. Kindergarten is a big step in our children’s life, and it can be overwhelming entering a room full of busy adults and little people. I thank you for your ongoing support around our rhythm. Please continue to remember hats, shoulder protection, home toys stay at home and to be on time, particularly in the afternoon. The children have waited all day to see you and are often disappointed when kept waiting. Lastly, please familiarise yourself with the Parent Pockets. Newsletters will be placed in your pockets for you to take. Thank you. I will leave you with our morning tea verse. Bless the water that gives us rain. Bless the earth that gives us grain. Bless the wind that helps seed spread. The children were delighted to be greeted on Monday morning by beautiful red, gold and orange leaves that had fluttered down over the weekend. Even though the weather has been warm the mornings are crisp and clear and there has been joyful play in our Autumn garden each morning. We have begun a new morning circle and the children are enjoying the rhythmic songs and galloping off to the orchard to pick apples. Our Autumn Harvest festival will be on the last day of term, Thursday 24th March 9-11am (approx). An invitation will go home next week. Thank you to all our Parents who participated in our first Class Parent Meeting this week – your support is much appreciated by myself and ultimately your children. Class 1 are playing and working beautifully and with much energy! They will need lots of sleep this weekend. Thank you to the parents who attended our Class meeting last Thursday night. It was wonderful to have Sue Murphy from our Learning Support team join us to give a picture of the Movement program she does with the class on Monday mornings and share insights about the class. Sue demonstrated a ‘blanket wrap’ to assist children with sleep, centering and calming. Instructions are available on a handout if you have not already received one. These past two weeks we have started our Main Lesson on Native American culture and tradition. We have been hearing the stories of Jumping Mouse and The Praying Flute. Rich stories to create and inspire our own book making ad build our literacy skills. We have finished our “Let There Be Light” (creation) Main Lesson which the children have thoroughly enjoyed!!! We finished with Noah’s Ark which has led us into our next Main Lesson of “Man and Measurement.” The children have discovered that people measured with their body first and the first informal measurement was ‘cubits.’ The length from a person’s elbow to the tip of their middle finger. The children have been busy measuring and comparing each other’s’ cubits and we also began to measure the length of the Ark! Lots of patience was needed for this activity!!! Class 4 and Class 3 had a wonderful time at the Seymour Alternative Farming Expo seeing lots of different animals, farming equipment, and interesting ‘little houses’ including Nicole’s amazing truck home. We are leaving Kalevala after finding many golden words and exploring some of the beautiful images creatively. Now we are exploring our Indigenous local area and learning more about the area where we reside, looking closely at the landscape and all that is growing and living in it. 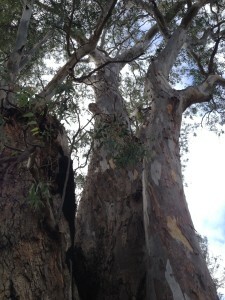 We found an old, old gum tree on our Friday walk with many inhabitants and beautiful bark. As we wind down the Indian Main Lesson we start looking closer to home. 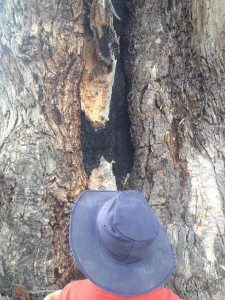 This week we have begun a Main Lesson on the Australian Inland Explorers. We are beginning with the arduous crossing of the Blue Mountains back in 1813, and what that meant for the expansion of European settlement in Australia. We are already asking questions relating to the hardship and hunger experienced by European settlers within a couple of years of arrival, yet there had been people living in the same areas, with the same environmental challenges for thousands and thousands of years…?? From the Blue Mountains we will head further south and closer to home to explore the lives and times of ‘local’ explorers, and the meetings between Aboriginal and European cultures. Should lead to very interesting conversations! Class 6 have been out on a couple of geology field trips in the past fortnight learning about how ancient geological processes have shaped our landscape. First we took a walking trip to visit Mt Consultation, a very local extinct volcano, which you can easily see towards the south east of the school. What appeared to be just another hill gradually revealed itself as we walked uphill tracing the changing nature of the soil and rocks. 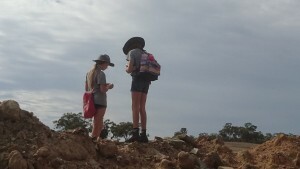 We observed coloured bands of soft sedimentary rocks, and pale soils with occasional intrusions of harder sandstones or quartz veins, and saw the work of water, eroding and washing away the soft soils to form new sedimentary deposits elsewhere. In a pile of crushed quartz that had been dumped in an eroded gully one of the children found a perfectly formed and transparent quartz crystal. The flanks of the hill are littered with lumps of light, gas filled scoria, and the peak is composed of solid, dense basalt, forming a plug in what was once the main vent of the volcano. From the peak we looked south to Mt Franklin and imagined the chain of volcanoes stretching across south-western Victoria, into South Australia. Yesterday we were out again, this time to go deep into the earth at the Central Deborah goldmine. 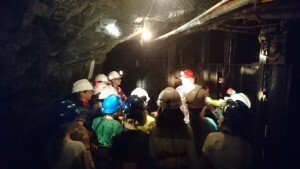 Our guide, John, took us around 65 metres down to the second level of the mine. It was wet, and surprisingly cold! 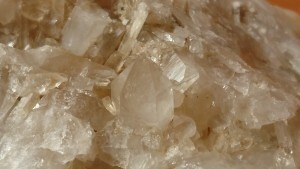 John described the geology of Bendigo that led to the formation of gold-bearing reefs and described the knowledge and techniques that gold miners used to find their way through the very hard sandstones to their goal: quartz intrusions or reef that flowed through cracks in the stressed rocks, and along with the quartz, veins of gold. The quartz reefs flow in beautiful curves and ripples, almost serpentine in character. When we came back to the surface, our day wasn’t over yet. We walked across town to the Golden Dragon Chinese Museum, temple and garden. If you have not visited the Chinese Museum, I highly recommend you do. The children were spellbound by the dozens of exquisite artworks and shimmering parade dragons. 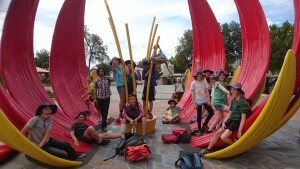 We heard the story of Chinese community in Bendigo and Central Victoria. (Did you know that Guildford had a larger Chinese community during the gold rush, than Bendigo). And now, from treasures of the earth to the wonders of the heavens: our next Main Lesson is Astronomy. We have almost completed our first Main Lesson on the Medieval World and the children have produced some truly beautiful, detailed work. Next week we begin our Mechanics Main Lesson. Very soon it will be the holidays and straight after that in Week 1 of next term we will be setting off on our first camp at Mt Arapiles. Please complete the forms and get them back promptly. Many of the students are working with Nicole towards a special Eurythmy performance at the end of term. The enthusiasm of this class is a wonderful quality. Well done Year 7 students and thank you parents! 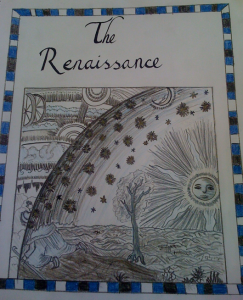 Class 8 have entered the Renaissance world, a unique period in time (1400 – 1600) that saw huge advances and changes in the evolution of human consciousness. 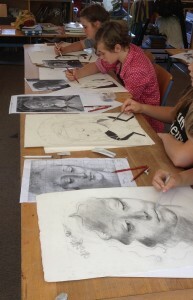 We are finding out more about what was new, and what had never existed before through biographies of such people as Joan of Arc, Leonardo da Vinci, Michelangelo, Raphael, and Martin Luther, to name a few. 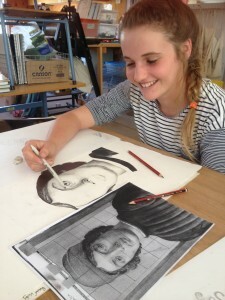 Studies will also include Greek and Roman influences, perspective drawing, the lives of the great rulers during this time, the leading families within the major cities of Europe and the Reformation. Here is a title page by our most senior student who had a birthday on Monday. Congratulations Sage! We are all working well and accomplishing a great deal in all classes. Class Four were finally given their wooden shields and sanded them back with gusto on Friday afternoon. 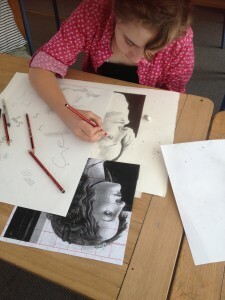 Class Eight are producing outstanding Renaissance Portraits in Art class. I am, as I always do, enjoying every moment with the senior class, while they work hard on producing work to the best of their ability. Should we continue to look upwards? This is the beginning of a piece that Class 8 is well at work with in Eurythmy at the moment. They are uncovering the gestures of the sounds and feelings within the words, and bringing it to life through their movement and presence to its meaning. Theirs will be the only class piece included in the upcoming Eurythmy Performance, with the other student piece being worked up by the ‘Eurythmy Ensemble’ composed of Class 7 & 8 students who’ve been coming at lunchtimes to practice with the generous piano playing of Anne-Meike. The other pieces of the program are duets and solos performed by Anne-Meike and myself. It is such a rare opportunity to be working not only with another Eurythmist, but one so well known to me through our 4 years of being classmates in Eurythmy School together. She is leaving at the end of March and so I hope you – and your neighbours, friends and workmates too (!!) – can all come to the performance. There will be a light supper to follow (and any assistance with this is greatly appreciated!) Wednesday 23rd March, 7:30 pm in the School Hall. Term One is already progressing quickly as we find ourselves at the start of the autumn season (l’automne) already. In Class One our singing has taken us from Heads and Shoulders, Knees and Toes (La tete, les epaules, les genoux, les pieds) to Frere Jacques and we have a room filled with lovely French singing voices for ten minutes every week! And in Classes Seven and Eight students have been exploring their Main Lesson themes of Medieval and Renaissance history with the traditional French story of Bisclavet, a fairytale from Brittany which has been told for hundreds of years to illustrate ideas about the French code of chivalry. Our conversation class on Fridays is also progressing well, with students practising how to ask questions about personal appearance and age, while learning parts of the body through the song Chez le docteur (a Visit to the Doctor). We certainly have several fine actors in the class when it comes to illness and injury! Our thoughts turn to water in all this heat. 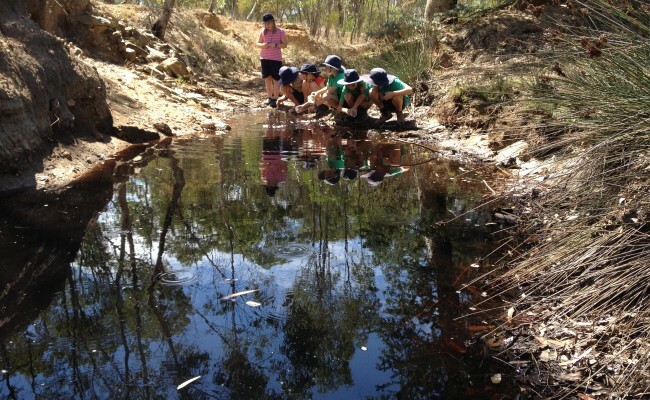 Class Four are investigating soils down by Bassett Creek which runs through our school. Our zucchini have gone mad so we made a zucchini cake and will freeze a batch to use in the future. Class Three have begun a forest. They have been potting up seedlings of Yellow Box and Golden Wattle which we will grow on to plant in the grounds of our school over winter. Thanks to Frances Cincotta of Newstead Natives for the donation of seedlings. It has been a pleasure to work with classes 7 and 8 this term on their music theory and musicianship. I am so impressed by the zeal and care that is evident in the way they are approaching their theory workbooks. 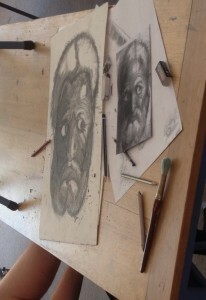 I am definitely being kept on my toes in regard to marking their work – it is difficult to keep up with! Class 7’s are devouring The Music Theory First grade book and class 8’s have now started on Second grade. It is particularly pleasing to see the efforts of those who are new to reading music giving their best efforts as well as to observe students helping and supporting each other in their understandings. Whilst gaining a deeper understanding of music theory as it is now in the 21st century we are immersing ourselves in the sounds of the Medieval Modes and experiencing sounds that are so mysteriously beautiful that they sound at once old and new. The Spanish program is immersed in the Spring Festival happening right now in Spain. 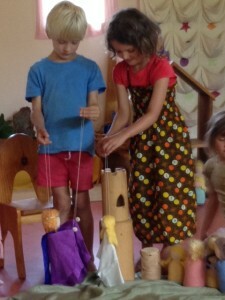 The children here at school are involved in real life scenarios to improve speaking skills. The main theme of the week has been songs about seasons, animals and the surrounding environment, which are written and drawn in our Spanish books. The Swimming Program is finished now, but what a wonderful program and teachers we had! The program has been a complete success and the kids, I assure you, have learned all the basic swimming skills. The School is bidding a sad farewell to José as a teacher at the end of this term. José has been teaching Spanish and PE with us since 2013, but his permission to teach from the Victorian Institute of Teaching has now expired, and he is leaving to pursue other paths – including more travel! José’s last teaching day will be March 15. We had a lovely start to our Wednesday morning get togethers, with parents new and old coming together for a chat, a cup of tea and some muslin dyeing. Aleesha’s flowery yellow shade cloth was a beautiful addition to the outside space and the little ones enjoyed the new sandpit pots and pans. Next week we’ll be making some Autumn gnomes. You’re very welcome to join us. Drop in to the Parents Room anytime from 9am on Wednesdays. The Craft Group is meeting on Mondays this term at Penny’s house (109 Main Street, Campbells Creek) from 12.30 to pickup. Contact Brenna (0468 335 765) or Penny (penelopegilbert@me.com) for more information. Over the next few weeks the Parents & Friends will be helping with supper for the Eurythmy performance on 23 March and starting work on our inaugural Autumn Harvest family bush dance! Car keys, purple tag with other various keychains. See office staff. Don’t miss out on the chance to be published for free in the first Vox Bendigo Book: A Young Writers Anthology. Entries close 24 March. Bendigo Writers Festival in association with the Rotary Club of Bendigo invites your students to enter their writing. The theme is MY PLACE. A place you love to visit, a place that has changed, a place that is special, or a place that is important to the whole community. Use your imagination or research a place that you are curious about. We are looking for writing that is lively, thoughtful and entertaining. The judging panel to select the winning entries consists of Cecile Shanahan, John Charalambous and Penny Davies. Submissions of any kind of writing – stories, poems or prose – can be up to 1000 words. All entries must be submitted by the end of Term One – Thursday 24 March. Saturday 5th March @ 46 Ray St. 9am-2pm. Moving house so lots of bargain clothing, books, kids stuff & bric-a-brac.